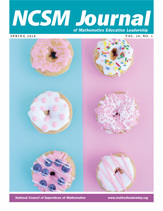 The NCSM Journal of Mathematics Education Leadership is published twice yearly, in the spring and fall. It is mailed to member of NCSM only. They are not available by subscription. You can view the journals online from Fall/Winter 2004 to the present. Readers are invited to submit letters to the editor regarding any of the articles published in the journal. We want to hear about your reactions, questions, and connections you are finding to your work. Selected letters will be published in the journal with your permission. Promoting networking and collaboration among NCSM members and other stakeholders in the education community. 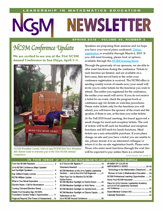 The NCSM Newsletter is published at four times a year, in the fall, winter, spring and summer. It is mailed to NCSM members only, as a benefit of your NCSM membership. You can view the newsletters online from Fall 2003 to the present. Inquiries about and materials for NCSM Newsletters may be sent to the NCSM Newsletter Editor. Permission to photocopy material from the NCSM Journal of Mathematics Education Leadership and the NCSM Newsletter is granted for instructional use when the material is to be distributed free of charge (or at cost only), provided that it is duplicated with the full credit given to the authors of the materials and the NCSM Journal of Mathematics Education Leadership or the NCSM Newsletter. This permission does not apply to copyrighted articles reprinted in the NCSM Journal of Mathematics Education Leadership or the NCSM Newsletter.